Tooth decay and gum disease are the most prevalent dental diseases amongst both children and adults. They are also two of the most easily prevented diseases. Tooth decay starts with the erosion of your tooth enamel and leads to holes in your teeth, called cavities. If left untreated, these cavities worsen and the entire tooth becomes compromised. The infection can spread to your gums, root canal and jawbone. Both tooth decay and gum disease can result in tooth loss and bone loss. The good news? You can prevent tooth decay and gum disease with simple, easy and affordable steps. 1. Brush your teeth twice a day. Pretty easy, right? Don’t underestimate its importance. This is a simple step that should never be overlooked. 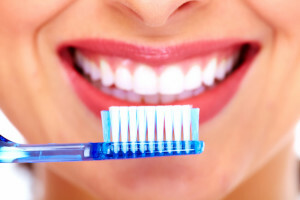 Brushing your teeth in the morning and again at night is important to remove plaque build-up and bacteria that leads to tooth decay and periodontal disease. 2. Floss daily. Your brushing is not complete without flossing. Floss can reach the crevices too small for your brush bristles, so it’s a necessary step for a clean mouth. Plaque builds up in these small spots between teeth and around your gum line, often resulting in tooth decay and gum disease. 3. Skip the sugar. Sugary and starchy foods cause a reaction in your mouth that leads to tooth decay. Sugar reacts with the bacteria in your saliva to form an acid that erodes your tooth enamel, the outer protective layer of your teeth. 4. Swish with mouthwash. For an added boost to your oral hygiene routine, rinse with an anti-bacterial mouthwash. 5. Use fluoride toothpaste. Fluoride helps strengthen your tooth enamel to combat tooth decay. 6. Brush your tongue. Don’t neglect your tongue! Your tongue harbors bacteria too, so use your toothbrush or a tongue scrapper to give it a cleaning. 7. Pay attention to your mouth and gums. Note when your gums look inflamed or if you spot blood while brushing. Don’t ignore aches and pains. Consult your dentist to make sure it’s not a symptom of something serious. 8. Visit the dentist every six months. It’s vital for the health of your teeth and gums that you visit your dentist for a dental cleaning and check-up twice a year. Don’t assume that you can skip an appointment because your teeth look healthy and you haven’t experienced any pain. A dentist has the expertise to see symptoms or signs of trouble that you can’t. Also, a dental cleaning removes tartar build-up that cannot be removed at home. Dr. Jeffrey Allen provides comfortable dental care to patients of all ages. Call (641) 628-1121 today to schedule a checkup and cleaning, cosmetic consultation, or second-opinion visit. We are located on the west side of the historic town square in Pella, IA. Please see the map for directions.